Capt. 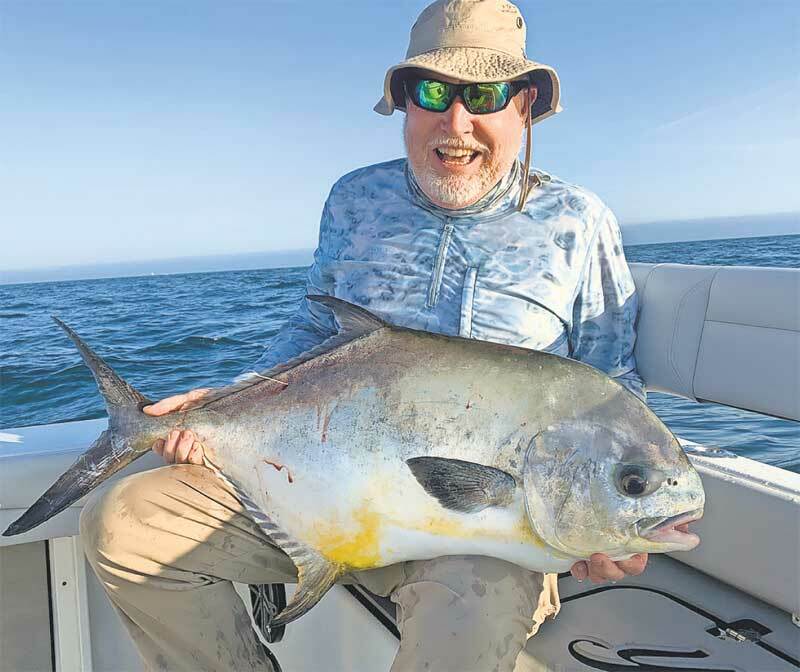 John Gunning, formerly a guide in the Bahamas now resid- ing on Riverview Boulevard in Bradenton, had a goal to catch a big permit and he checked it off his bucket list first thing on a morning charter March 12 with Capt. Jason Stock. The permit — 36 inches to the fork — was tagged for Bonefish & Tarpon Trust and released. 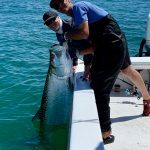 B&TT has a mission to conserve and restore the bonefish, tarpon and permit fisheries and habitats through research, stewardship, education and advocacy. Gunning limited out on kingfish and a nice blackfin tuna capped the fishing trip on Stock’s new 26-foot yellowfin. 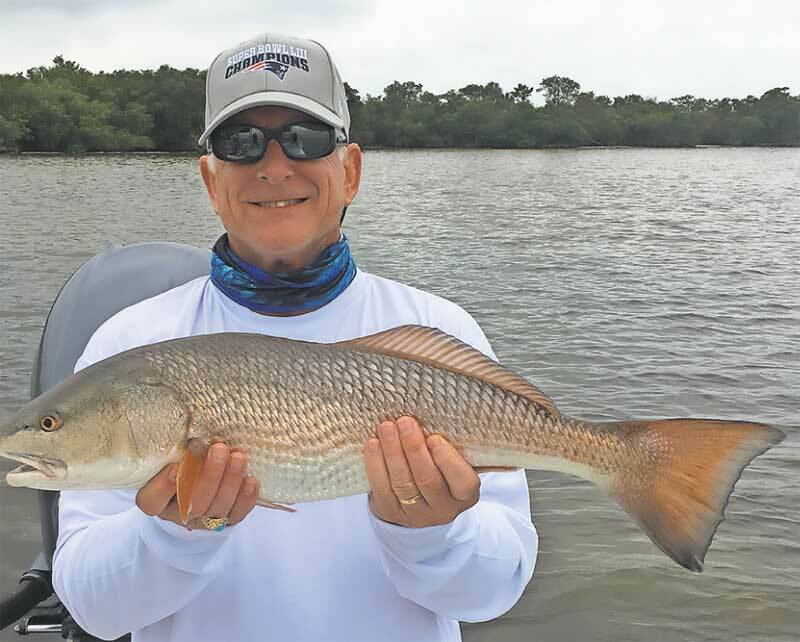 Randy Perry of Natick, Massachusetts, shows off a 26-inch redfish he caught and released with Capt. 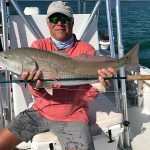 Danny Stasny of Southernaire Fishing Charters. Fishing around Anna Maria Island is settling into a springtime pattern. Despite a few mild cold fronts, fishing inshore and offshore is heating up. 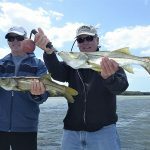 Catch-and-release snook are dominating the inshore bite for those sport fishers looking to bend a rod. Shallow grass flats adjacent to mangrove shorelines are holding exceptional numbers of linesiders as they stage up on the feed. Casting live shiners in these areas is producing some stellar fishing, with catches occurring on almost every bait. To experience this bite, you need to know the peak times of the tide and where to be at those times. Spotted seatrout are making a decent showing on deeper grass areas. Again, being in the right place during the right stage of the tide is crucial. Another welcome arrival to our inshore hunting ground is Spanish mackerel. These migratory fish seem to have arrived in good numbers and can be found along the beaches and in Tampa Bay. Look for the birds diving into bait schools, and there is a good chance the macks are there, too. Offshore is host to a variety of migratory species, including kingfish, cobia, blackfin tuna and amberjack. 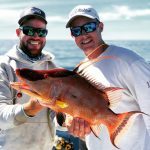 Don’t forget to try some bottom fishing for snapper and grouper, as this bite should improve as spring — which officially starts March 20 — progresses. On my Southernaire charters, I’m spending a lot of time targeting catch-and-release snook. These fi sh are one of my favorites to catch and my excitement is rubbing off on my sport-fishing clients. Snook sessions of 30 or more fi sh are not uncommon, especially during swift moving tides and water temps in the mid to upper-70s. Numerous linesiders 20-30 inches are being caught, with fi sh exceeding 30 inches mixed in. And speaking of the mix, I’m seeing some large, spotted sea trout, as well as upper-slot catch-and-release redfish on the hook, while targeting the linesiders. When looking for a more consistent bite on trout, I’m fishing deeper areas where lush grass exists. Fishing in areas with slight drop offs at the edges of sandbars is providing good numbers of these popular backwater fish. Jim Malfese at the Rod & Reel Pier is seeing an abundance of sheepshead being caught in Tampa Bay. Casting live shrimp under the pier deck is triggering the sheepies to bite. While targeting these buck-toothed convict fish, pier fishers are hooking into fl ounder and black drum. Casting jigs from the pier is producing action on some new arrivals — Spanish mackerel and jack crevalle. Working jigs on the surface is producing results. Letting the jig sink to the bottom is working, too, especially for pompano. Capt. Aaron Lowman is fi shing nearshore structure for variety. Using shrimp as bait, his anglers are reeling up sheepshead, Key West grunts and mangrove snapper. Switching to live shiners is working especially well for Spanish mackerel and kingfi sh. Moving inshore to the flats, Lowman is finding catch-and-release snook accommodating for his clients. Casting free-lined live shiners under docks and along mangrove cuts is producing good action. Lastly, the deep grass fl ats are resulting in spotted seatrout for the coolers. Capt. Warren Girle is fi shing nearshore structure with good results. Mangrove snapper are being found in good numbers and are readily taking live shrimp as bait. While targeting snapper, Girle is catching a variety of other species, including Key West grunts, flounder, sheepshead and porgies. Moving inshore, Girle is putting clients on catch-and-release redfi sh around residential docks and oyster bars. Also present in these areas are black drum and an occasional catchand-release snook. Fishing deeper fl ats for spotted seatrout is putting fish in the cooler. Free-lining live shiners is resulting in some slot trout, as well as some shorties. Lastly, fishing the passes and just outside the passes is resulting in numerous Spanish mackerel and bonito for Girle’s anglers. Capt. David White of Anna Maria Charters is using a variety of methods to find fish, depending on the weather. On cooler, breezy mornings, White is baiting hooks with shrimp inside the bays and Intracoastal Waterway for sheepshead and black drum. Casting around docks is producing this bite. Also, on these mornings, White is drifting and jigging for pompano. On warmer mornings, live shiners are producing trout, Spanish mackerel, jack crevalle and snook. On the calm days, White is venturing offshore for amberjack, barracuda, red grouper and African pompano. Also in the mix: some tasty mangrove and yellowtail snapper. Capt. Jason Stock says offshore fi shing is heating up. Fishing around wrecks is producing a variety of species, including permit, kingfish and an occasional cobia. Blackfin tuna also are present on wrecks. Fishing hard bottom and other structure is producing action on big mangrove snapper and red grouper. Lastly, amberjack are being found in abundance. Not only do these fi sh readily take a bait, once hooked, they fight to the end. 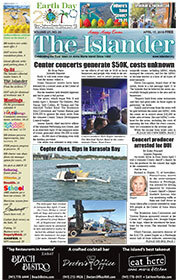 Send high-resolution photos and fi shing reports to fish@islander.org.